When I was young, I never really understood my parents’ insistence to only use olive oil imported from Palestine. It took a long time and a great distance in a process that was neither cheap nor convenient. The oil came in old beat-up containers that did not look appealing to me at all. In my head, if they wanted to support distant family back home, they could just send them money and save them and us a big hassle. We could just use the nice looking olive oil containers from the nearby store. Yet, this was never an option in our household. The only olive oil we used at home was from Palestine. As I grew up and started a student part-time job, I worked with olive oil a little. I knew all about olive oil imported from Spain, Italy, and other countries. I knew which ones were better and more expensive. I also learned to tell, based on the pungent taste, which ones were extra virgin. I was tempted to use my employee discount to bring home one of the fancy bottles and use at our kitchen. I could not get myself to do it, and I did not exactly know why. I felt like it would be disrespectful to my parents even if it did not make sense to me. It did not feel right. It was not an option. After living in Palestine for a year during the olive-picking season, something changed. The olive-picking season in Palestine is holy. Palestinians relate to the weather based on how it would benefit or harm the olives. There is well-known unspoken rule about treating olive trees with respect. There is a day off from work just to pick olives. On public transportation, it is not unusual to hear someone on the phone telling their friend to stop by for their share of this year’s olive oil stored in what used to be a Coca-Cola or a liquor bottle. A driver will stop in the middle of the way to give his brother- in- law a jar of olives that are so close to one another that they start to crush showing their insides. In Nablus, the owner of the Nabulsi soap factory takes pride in how picky he is about getting his olive oil. He insists on filling a cup to let me smell how authentic it is and smirks as he sees my diasporic facial expressions transform in appreciation of its strong smell running through all of my brain cells. I started noticing how olive oil is an essential part of so many dishes. 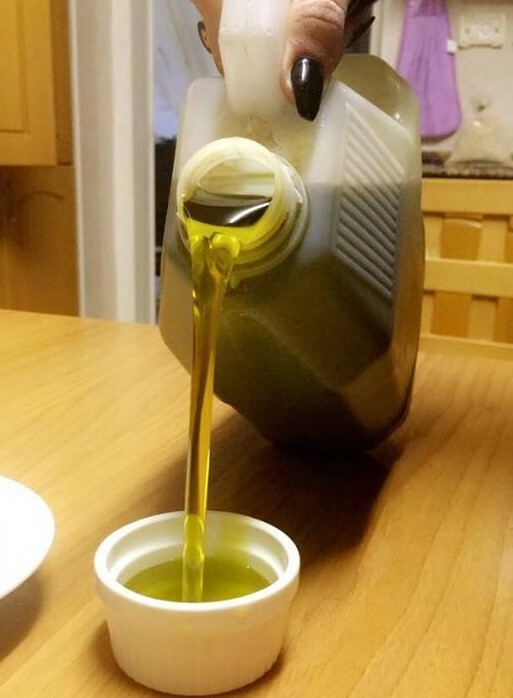 “Palestinians drink more olive oil than water,” I would jokingly say and they would laugh in agreement. Olive oil is truly an everyday ritual. They fantasize about its color when it is fresh and remind me that it starts to change as it reacts with oxygen over time. They dip their bread into olive oil, just like that and without any additions, and enjoy it more than the sweetest of all foods. I can guarantee that every lunch invitation (عزومة) I received during the olive-picking season was a chance for my hosts to share their olive oil using Msakhan (a traditional Palestinian dish). I now have a deeper understanding of the psychology behind the burning of olive trees by Israeli soldiers and why farmers moan at the scene as if they lost a loved one. Wherever you are, if it is accessible to you, make sure your olive oil is Palestinian. Your ancestors would want that.